The Dickies Calder Boot offers steel protection in both the toe-cap and the midsole. 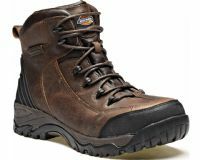 A padded collar and tongue offer excellent comfort and the inner lining of the boot has an internal water resistant membrane. The waxy full grain cow leather across the upper give this boot a fantastic look.​ These are premium quality boots perfect for the agricultural, building and construction trades. Cemented rubber outsole with EVA . Waxy full grain cow leather. Size 6 available to order upon request.